Were You Hurt Because Your Ship Wasn’t Seaworthy? Whether you work on a barge, lounge on a cruise ship, or take a ferry as transport, when you step onto a commercial watercraft you have a certain expectation that the vessel is in good shape and is seaworthy. Unfortunately, this reasonable expectation of safety may not always be honored. As a result, an unseaworthy vessel can place workers and civilians alike at risk for serious injuries—injuries that may require significant treatment and compensation. The general definition of seaworthy can be stated as follows: A vessel is considered seaworthy only if she, her crew, and all of her equipment are considered reasonably safe to use and perform her assigned tasks and intended purpose. In order to declare a vessel fit for duty, the following factors must be addressed. Ship integrity. The physical strength and structure of a vessel itself are the main standards for determining seaworthiness. A vessel is considered in good condition as long as her hull and structure are stable and free of holes, she can withstand choppy waters, she can hold her buoyancy, she is free of any debris or hazardous materials, and she is equipped with proper emergency and fire equipment. Equipment and maintenance safety. A vessel’s physical characteristics and design aren’t the only determining factors for if a ship is seaworthy. A seaworthy vessel must also be physically able to carry out its intended mission. As a result, all of the equipment aboard the vessel must be maintained and in good working order. 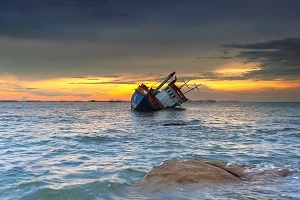 Although it may not seem relevant, a broken crane can place the entire vessel in jeopardy, and therefore would be considered a factor for declaring the vessel to be unseaworthy. Crew member competency. Just as a vessel’s equipment is essential for determining seaworthiness, so is her crew. A crew member who is not of reasonable disposition (prone to anger or violence) or reasonable health may cause the vessel to be unseaworthy. The vessel owner must exercise reasonable care in vetting its employees during the hiring process as well as in monitoring the crew throughout voyages to ensure everyone on the ship is as safe as possible. Maritime law has many details and exceptions when it comes compensating people who have been injured aboard a ship. For crew members—but not passengers—liability and compensation may fall under the Jones Act or the Longshore and Harbor Workers’ Compensation Act. However, an injury caused because a vessel is not equipped to handle the perils of the sea is a separate grounds for a legal claim for injuries. Such a claim is independent of specific laws, such as the Jones Act, and draws upon the older traditions of general maritime law. In short, the owner may be liable for damages as a direct result of his negligence with securing a reasonably safe working environment. Neither lack of knowledge nor control of the condition is a defense, as seaworthy liability is assigned without regard to fault. Therefore, if a crew member suffers a loss on a vessel because of her unseaworthiness, the owner is liable under general maritime law. Seaworthiness is not a simple concept to understand. In fact, maritime law is a difficult subject to master; it’s filled with confusing terminology and hundreds of years of legal precedents. Fortunately, you don’t have to wade through the hard work by yourself. Ensure that you have a strong vessel to get you through the storm by contacting Steve Lee today. Our law firm will not only help you understand your legal options, but we can also help you pursue the full settlement available for your claim. Call today for your FREE, no-obligation consultation. We’re waiting to help you. Did you find this article helpful and interesting? If so, please, let us know by “liking” us on Facebook and sharing this link with your friends, family, and co-workers—especially if they make their living on the water.